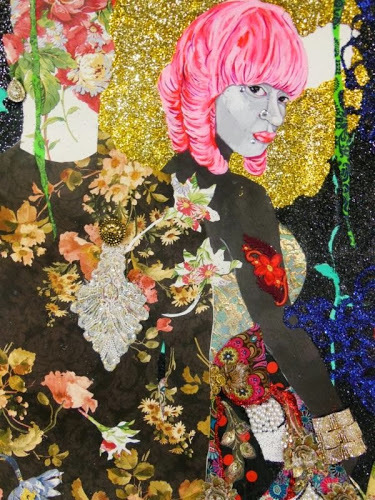 Ebony G. Patterson (Jamaican, born Kingston, 1981, works Lexington, KY) is the recipient of many prestigious fellowships, awards and grants, including Musgrave Medal from the Institute of Jamaica (2012), The Andy Warhol Foundation Grant (2012), and Rex Nettleford Fellowship in Cultural Studies (2011). Recent exhibitions include Six Degrees of Separate Nations, Frost Art Museum, Miami, eMERGING: Visual Art and Music in a Post-Hip-Hop Era, The Museum of Contemporary African Diasporan Arts (MoCADA), Brooklyn, Aruba Biennial: Happy Islands, Jamaica Biennial, National Gallery of Jamaica, Kingston, and Caribbean: Crossroads of the World, The Studio Museum in Harlem, co-organized with El Museo del Barrio and the Queens Museum of Art, New York. In 2014, Caribbean: Crossroads of the World, will travel to the Perez Art Museum Miami and Patterson’s work will be included in Disguise: Hidden Dimensions in African past, present and future art at the Seattle Art Museum and European Masters and Creativity in Caribbean Fine Arts at the Frost Art Museum, Miami. Patterson was recently lauded as “30 Black Artists Under 40” by The Huffington Post and “25 Artists to Watch and Collect” by ArtVoicesMagazine.com and graced the cover of the International Review of African American Art, Vol. 24, No. 3. Patterson is Assistant Professor in Painting at the University of Kentucky in Lexington.